Situated between the towering mountain peaks of the Parvati Valley, Tosh is believed to be blessed by Lord Shiva with evergreen forests and gushing rivers. The mythology surrounding the town has made it a popular camping destination visited by travellers from all around the world. You will also trek to Kheerganga, a meadow of lush grasslands that is known for its natural hot water springs. Located at an altitude of 9,700 feet, Kheerganga is believed to be the spot where Lord Shiva meditated over 3,000 years ago. • Climb up to an altitude of 9,400 feet on a trek to Kheerganga and Tosh. • Visit the waterfalls at Rudra Nag and hot water springs at Kheerganga. Travellers are required to adhere to the instructions of the trek leader during the Tosh Kheerganga trek. Consumption of liquor, drugs, tobacco products and cigarettes is strictly prohibited during the Tosh Kheerganga trek. For cancellations made more than 3 days before departure of the Tosh Kheerganga trek: 30% refund. For cancellations made 0-3 days before departure of the Tosh Kheerganga trek: No refund. 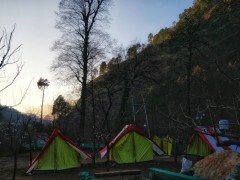 The tour operator reserves the right to cancel or alter the itinerary of the Tosh Kheerganga trek to maximize the safety of travellers as well as staff. Passing through cabins and huts. Wake up to the sound of chirping birds and take a morning walk in the misty mountains of Tosh. Today, you will embark on a gorgeous trek to Kheerganga. Begin your journey by hiking towards Rudra Nag, where you can stop to visit its famous serpent shaped waterfall. En route, you will also trek through the quaint villages of Kalga and Pulga before arriving at the splendid meadows of Kheerganga. Spend the evening dipping your tired feet in the natural hot water springs at Kheerganga and feel the cool breeze that blows through the forests. 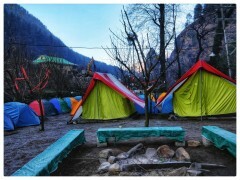 Overnight at Kheerganga in tents. Cloudy skies and green meadows. You will be accommodated in guesthouses at Tosh on a triple-sharing basis. Depending on availability and prior requests, rooms may be allotted on a twin-sharing basis. Today's meal package includes breakfast, lunch and dinner. Evening views of the campsite.